A few years ago Aoradh set up a prayer room/Labyrinth in an old Shop. It was as ever a wonderful mix of manic busyness, stress, significant conversations and deep moments of grace. In the middle of all of this, I looked over to see one of my friends being prodded in the chest by a local Pastor who obviously had some problem with what we were doing. He was shouting something about ‘You people think you are the only people doing anything in this town’. My friend dealt with it really well (ie he did not smack him between the eyes in the name of Jesus) but most of us were rather shocked and upset by his nonsensical outburst. The fact that people whose only perspective of who God might be is viewed through a very narrow Conservative Evangelical set of goggles might have theological issues with what we do is a not a surprise of course. This perspective sees the duty of all Christians as saving people from eternal torment in the fires of hell. This has always included most other ‘Christians’, who are not really saved as they do not hold the same views. A couple of years later I (reluctantly) attended a churches together Carol singing session at the middle of my small town. I was rather dreading it- standing in the middle of the central street next to speakers relaying music being played by a fiddly group inside a church. The aforementioned Pastor was there too, along with great handfuls of tracts and books intended to spread a particularly strenuous version of the ‘Good News’. I was reminded of this by this story, posted by a friend on Facebook. 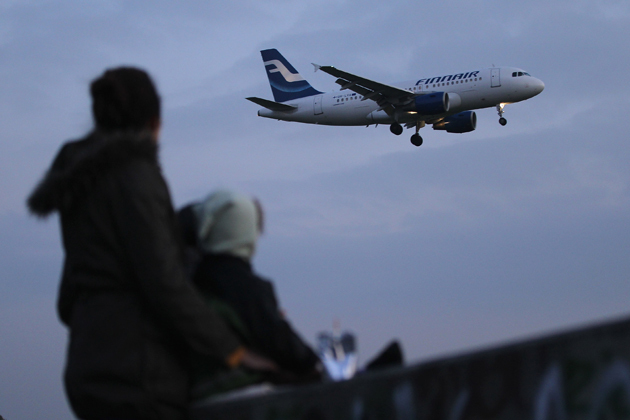 Anyone fancy joining us on the Friday the 13th Fin Air flight number 666 to Hel? It is lovely there this time of year. This entry was posted in It's a laugh! and tagged Aoradh, evangelicalism by Chris Goan. Bookmark the permalink.